What is Making Home Affordable (MHA) program? The Making Home Affordable Program (MHA) is a critical part of the Obama Administration’s broad strategy to help California, Washington and Oregon homeowners (and rest of the country homeowners) avoid foreclosure, stabilize the country’s housing market, and improve the nation’s economy. First established in 2009, HARP (Home Affordable Refinance Program) was initiated as an option for underwater homeowners wanting to refinance their mortgage at lower interest rates with government expectations that it would assist millions of homeowners who found themselves owing more on their mortgages than what their homes were worth. Up until now, HARP has fallen short of these expectations prompting the government to relax eligibility requirements in an effort to help more people stave off foreclosure. Billed as HARP 2.0, the government has extended the program until December 31, 2013 and set out new guidelines for those wishing to apply. Why HARP 1.0 didnÃ¢â‚¬â„¢t work and why the HARP 2.0 was launched? One of the biggest criticisms of the original plan was that in order to qualify, homeowner loan-to-value ratio was required to be less than 125%, automatically ruling out millions whose home value fell below that figure. This requirement has now been relaxed with HARP 2.0. How do I qualify for HARP 2? Your loan must be owned or serviced by Fannie Mae or Freddie Mac Later in this post I will show you how to find this information for your loan. Your loan must have closed before May 2009. How do I find out if my loan is owned by Fannie Mae or Freddie Mac? Note that even if you think the loan is owned by a bank where you make your monthly payments, the loan could still be owned/backed by Fannie Mae/Freddie Mac. And may still qualify. How much underwater I can be and still qualify for HARP? There is no limit to this. The guideline allows for unlimited Loan to Value Ratio (LTV). What that means is that you can qualify for HARP even if you are seriously underwater. For example, if your estimated home value is $200,000 and your loan balance is $350,000 you may still qualify if you meet other eligibility parameters. Do I have to get a HARP loan from my current bank or one of the big banks? No. There are several lenders large and small who are approved by the government to offer HARP loans to underwater mortgage holders. In fact, some of the recent news articles are talking about longer turn times and higher interest rates from some of these banks. It may be a better idea to work with a smaller lender, like Arcus Lending. Are appraisals required for the new HARP Refinance Program? In most cases, an appraisal will not be required. Even where an appraisal is ordered the value will have no impact on the loan decision. On loans where no appraisal is ordered, a Property Inspection Waiver (PIW) fee of $75 will be charged. 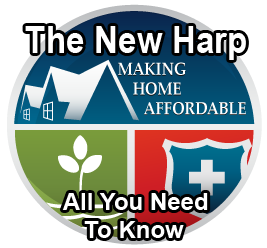 Can I get the new HARP if I have mortgage insurance (MI or PMI)? Will my mortgage insurance payments go up if I refinance into the new HARP? No. You can request for a transfer of the current mortgage insurance certificate to the new loan. Talk to your lender about it. What if I have no MI now, will I have to pay MI with HARP 2 mortgage because my LTV will be >80%? No, you wont have to. Even if the new loan will be >80% in LTV (Loan to Property Value Ratio) you still don’t need to get a mortgage insurance if you currently don’t have one. I have Lender Paid Mortgage Insurance (LPMI), can I refinance into the new HARP loan? If your current loan at the time of closing was over 80% and you are not paying monthly mortgage insurance, most likely you have a Lender Paid Mortgage Insurance (LPMI) programa . You would be able to refinance even if you have an LPMI. You would need to transfer the same coverage level from your current MI company to the new HARP 2.0 Refinance. What about HARP 2 mortgage rates? Both Fannie Mae and Freddie Mac have waived some of their fees to make sure the rates on the new HARP remains low. Some of the bigger banks are not passing all the benefits to the borrower and their rates are higher than some smaller lenders like us. We also offer no points and no closing cost refinance. To get a quote for the best HARP mortgage rates in the states of California, Oregon or Washington click here. Can I qualify for HARP if I have a 2nd mortgage? You can combine a 1st and 2nd mortgage and you can cash out with a California Home Affordable Refinance Program (HARP). But, you can still refinance the 1st mortgage if it meets the new HARP qualifying guidelines. You will have to get the 2nd mortgage re-subordinated. Your 2nd mortgage lender needs to approve this. Indications are, most of the lenders are willing to do it if you are refinancing your first mortgage under the new Obama Government Refinance Program. If you are refinancing the 1st mortgage through our company, we will help you get the 2nd mortgage re-subordinated. Do I have to be living in the house to qualify? Can I be late on my mortgage and still qualify? Yes, you can. And here how. Say if you are currently 30 days late on your mortgage payment and want to qualify for HARP 2 program. If you have not been late in the last 12 months and this is the first month you are late; you can now start making all your payments on time and qualify after 6 months. Remember the rule no late payments in the last 6 months and no more than 1 late in the last 7-12 months. Can I use HARP Again? Can I use HARP if my current loan is owned by other Government agencies like FHA, VA or USDA? No, to qualify for HARP your loan must be owned by Fannie Mae or Freddie Mac. Can I short sale my property after HARP 2.0 refinance? There are no pre-payment penalties or restrictions on HARP 2 refinance. Meaning, you can pay off or sell your house anytime after the refinance. Remember though, the purpose of offering you a program to lower your interest rates and the payment is for you to be able to afford the new payment and avoid short-sale or a foreclosure. What do I do next if I am ready to apply or if I need more information?